A disabled parking space outside the front of a large Tesco supermarket. Everyone knows exactly who is supposed to be allowed to park there and who should not park there. So why do some people who clearly aren't disabled decide to use these parking spaces? Do they think that this silly rule shouldn't really apply to them or something? 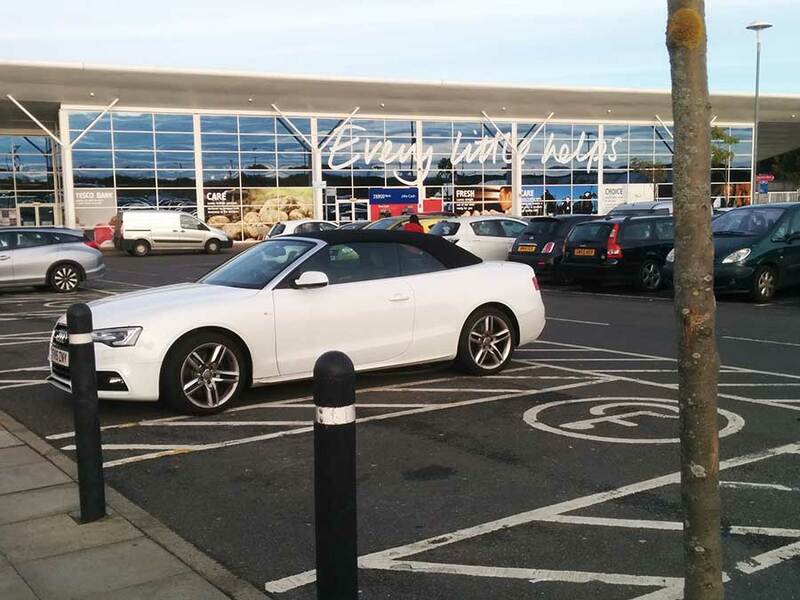 The car in the photo parked up in a disabled bay at a branch of Tesco near Eskbank in Midlothian. The female driver who got out of the car was smartly dressed and didn't appear to have any problems getting to the store as she jumped out of her nice car and strutted off to the store entrance. In fact she appeared to be as fit as a fiddle and the car didn't appear to have one of those blue disabled badges that cars are supposed to have on display when using disabled parking spaces. This is typical of the kind of selfish behaviour that seems to be becoming acceptable these days. More and more people put themselves first and disregard the needs of others. For example the drivers who see a queue of traffic and carry on up the outside lane so that they can push in at the front. Me first! I'm more important than you. No doubt this woman couldn't be bothered to park further away. Too lazy to look around for an alternative when those big spaces at the front of the store were up for grabs. In this case there were plenty of spaces for disabled drivers, but what would she have done if there was only one left? I'd be willing to bet she would have just parked there anyway. Disgraceful, completely agree. These kind of ignorant people should be slapped with a 30 day prison sentence. They won't learn otherwise and it's a complete abuse. Just maybe, the owner of that car needs a wide parking slot because of their driving (in)ability? I was just going to say what about someone who has a mobility problem but is not registered disabled. I know a guy who drives and see him in a company van, he cleans various public toilets near my area and he needs a hip replacement soon as he cant go on much longer without it. If he were to park in the disabled bays in the supermarket doing his shopping he would probably get a ticket yet he may be more in need to use it than someone who borrows their relatives car who may have the blue badge. They are the ones you need to crack down on. Even worse is a family I know who use disabled bays with the elderly parent's blue badge when only one of the kids is in the vehicle. These people need to be told that "Ignorance and stupidity are not disabilities"
Silly arrogant person leaving a car parked in a disabled bay but not being disabled themselves, just what the angry yobs that are around these days are looking for. I'm sure these upper class drivers can afford keying repairs!!! !